Julius Caesar. Denarius, 3.84gg. (6h). 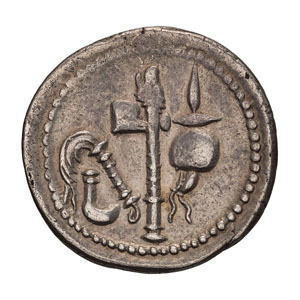 Gaul, 49-8 BC. 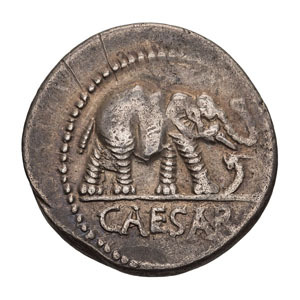 Obv: Elephant advancing right, trampling serpent; CAESAR in exergue. Rx: Ladle, sprinkler, ax with handle topped by lion's head, priest's hat (apex). Crawford 443/1. Sydenham 1006. Sear, Imperators 9. Cohen 49 (2 Fr.). EF. Privately purchased from Ed Waddell.